If you're trying to sell your home these days, you need all the help you can get. 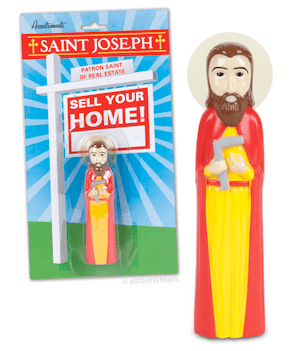 After you've picked the perfect realtor, slapped on a new coat of paint and tidied up the yard there's only one thing left to do: call upon the power of Saint Joseph, Patron Saint of Real Estate. All you have to do is bury his likeness upside down near the "for sale" sign in your yard and recite the "Prayer to Assist in Selling Your Home" (found on the back of the package) and you should have a horde of potential buyers lined up at your door in no time! Each figurine is 3-3/4" (9.5 cm) tall and made of hard vinyl.